In a perfect world, preparedness would be easy. But for so many of us there are challenges to getting it done. We might have the perfect plan, but life throws in kinks. Sometimes lots of kinks. 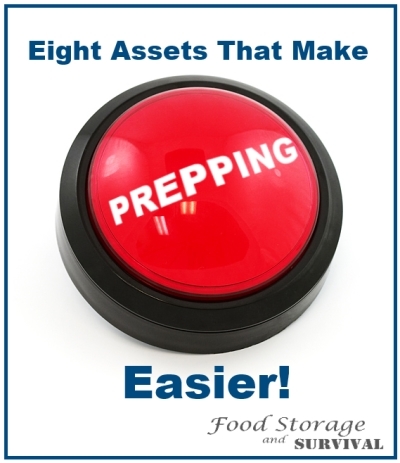 From my own experience I’ve compiled the following list of assets that make prepping easier. Don’t worry if you don’t have everything on this list. Most of them I don’t have either. We can dream about having all of them, but the truth is you don’t need to have any of them to get prepared! Having challenges just means we get to be a little more creative! Focus on the assets you do have and get started. 1. Lots of space. Either in your yard or in your house. For planting, building, and storing. 2. Older kids. Young ones are fun, but you know they’d rather play in the mud than pull weeds (okay, my older ones would too) even if that mud has your baby garden plants in it. Stick with it though, the older ones can actually be a ton of help! 3. Lots of time. 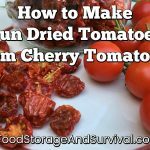 It’s tough canning everything you grow in your garden, keeping animals, making your own bread, and getting in all the range time you need if you work a full time job or two. Seriously. 4. Extra money. We’ve made it work without much extra cash, but it sure is easier to have extra money to purchase the things you want or pay someone to till the garden or buy lots of peanut butter when it’s on sale. 5. A cooperative spouse and family. Fortunately I have this, but some don’t. It can be a huge issue to have to deal with doing what you know you need to when your spouse doesn’t agree with your use of time or money for preparedness. 6. Perfect health. Wouldn’t that be nice? Illness, physical disabilities, and mental or emotional disorders can limit the amount of time and effort you can put into preparing. Any of these conditions in yourself or your family members will also add complications to your preparedness plans. 7. The right tools. It’s a bit challenging grinding wheat with two rocks, although I’m sure you can do it if you really try. And there is no canning vegetables without a pressure canner. The same holds true with tools for building or fixing things–sometimes there is no substitute for the right tool, other times you can McGuyver something together and get the same results with a little more work involved. 8. Lots of practice. Get over the learning curve. Like anything, self reliance is learned best when practiced often. What about you? What challenges have you encountered in your preparedness journey? Have you found anything that makes preparing easier for you? Good resources – print off information from the internet and have a few books in your personal library in case there's no electricity. Some of my must haves are a current canning book so I know processing times and the Encyclopedia of Country Living. and a GOOD sense of humor – for all the things that can/and do/ go wrong! Helps keep you focused when tired. That sure helps me! Don't even notice how much time it is taking. I can't wait to move where I can start prepping. Awesome Blog. Great ideas here. I am going to print this stuff out and keep it on paper. In case SHTF and we have no power. Thanks for what you do. I love your blog. Thanks for taking the time to help all of us get our lives in order so we can sleep when the wind blows.